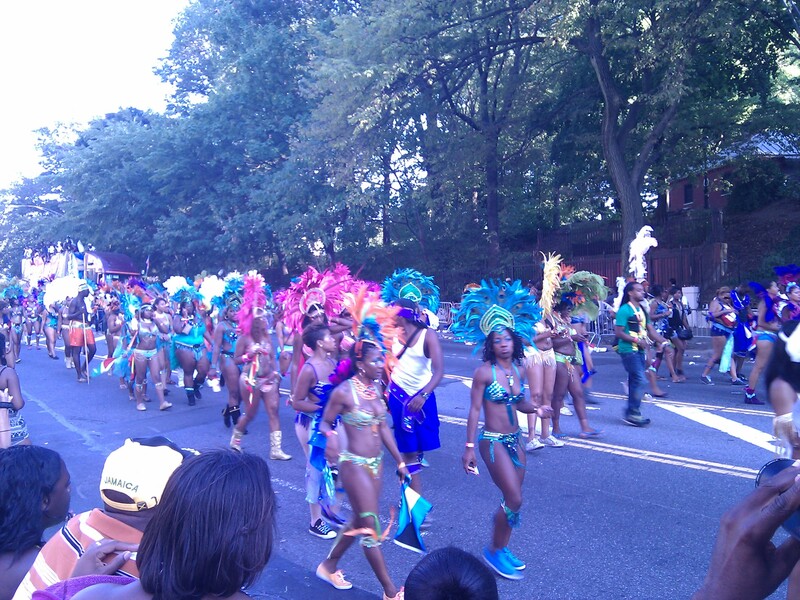 Yesterday was the West Indian-American Day Parade in Brooklyn and Mark and I went to check it out. We got there late, about 5, thinking we missed the parade and most people would have left, but the place was packed. 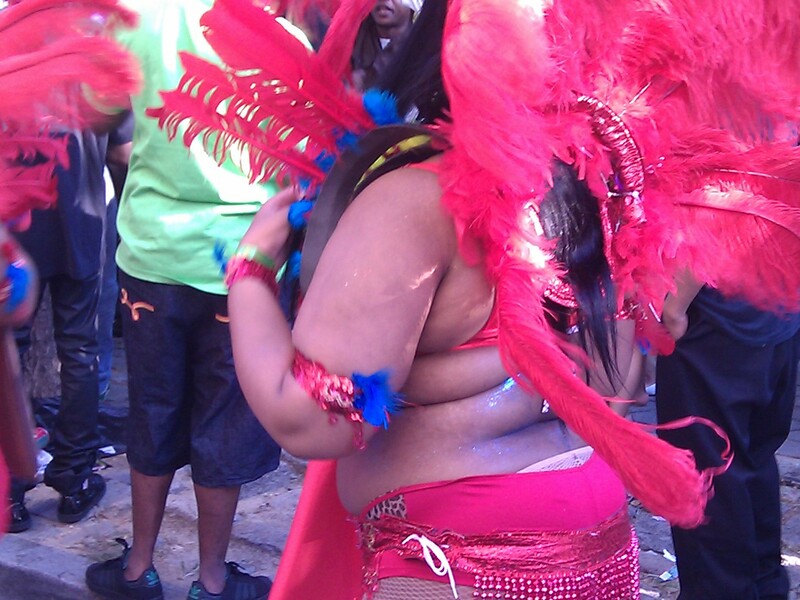 The parade was still thundering down the street with lots of big women in feather costumes. Think Mardi Gras designed by a Las Vegas showgirl costumer for the TV show The Biggest Loser. I saw just about everything. And a lot of it. ‘Parade’ probably isn’t the right word for it, either. That conjures up images of people marching in a steady stream, with floats or bands or fire engines following closely together. This was more like a ‘Drift.’ A pack of people would saunter over the top of the hill and then meander down the street, talking with each other, stopping to talk with each other, turning around to talk with each other. 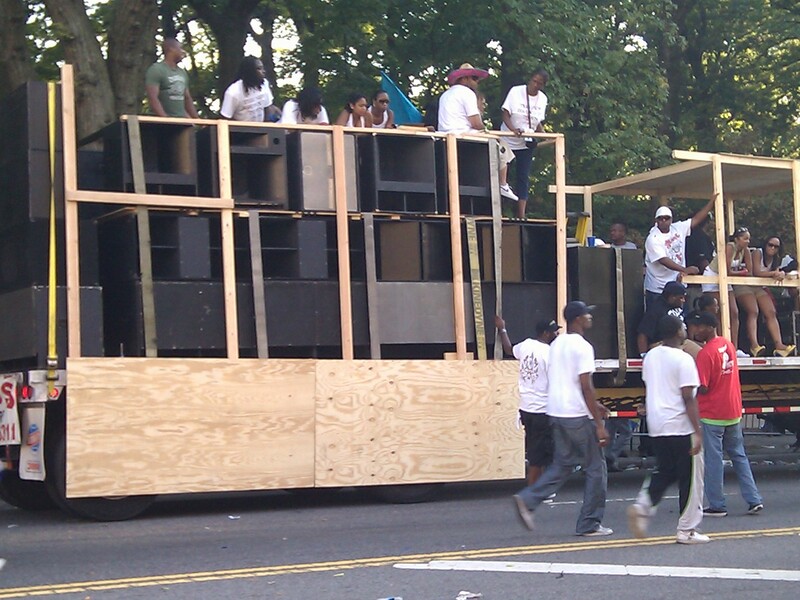 They surrounded flat bed trucks loaded with massive sound systems and a DJ perched on top. The sonic booms from the speakers felt like I was inside an MRI machine. If I stood still long enough the pattern of my skeleton would have been embedded in the brick wall behind me, like a Hiroshima victim. Parades divide people into two classes: parade marchers and parade watchers. But in a Drift, anybody can join the saunter, and when the designated Drifters want something to eat or drink they walk over to one of the hundreds of street carts along the route for a break. They don’t have to worry about the vendor taking his time to fix their food, because the Drift moves so slowly their group would still be there ten minutes later. People were having a great time. Lots of laughter. Lots of jiggling. Lots of white guys with cameras taking pictures of the feathered and bejeweled Drifters. We stayed till the last semi-trucks drove around the corner, though the party probably continued all night.